My husband and I have read books to our children ever since infancy and have always encouraged them, but really, we have never made an over-the-top point to push the girls towards reading and instead wanted them to discover the joy on their own. And somehow, it has worked. Both girls absolutely adore books and at multiple points throughout the day they can be found together or individually surrounded by piles while they flip through the pages and tell their own story. As both a mom and a former library employee, it makes me happy every single time. So what could make reading time better around our house? Why, a comfortable chair, of course. The perfect accompaniment to a good book is a soft sofa or chair so that you can sit back and delve into the pages of the tale for as long as your imagination lets you. Which is exactly why the P'kolino Little Reader Soft Kids Chair from Kids Chair World is just the thing to take book time to a whole new level of enjoyment for young readers. Founded when the owner recognized the importance of child-size furniture and the need for a great site to purchase them, Kids Chair World is the place to find high quality, fun, and functional furniture in all shapes, styles, and sizes. From rocking chairs to folding chairs to outdoor chairs, Kids Chair World believes that furniture sized for kids just has a way of making them feel special. You'll find all of your favorite top brands available and with a 30-day money back guarantee and free shipping to the continental United States, the hardest part will be narrowing down the selection to pick just one favorite. For us, it definitely is the P'kolino Little Reader. The day that it arrived, we couldn't wait to check out the plush foam and the extra-soft fabric and see just how comfy it would be. As I took this chair out of the box, right away I was impressed with the quality. The combination of the high-density foam and the cozy, stain-resistant faux suede upholstery are plenty durable and will easily withstand the wear and tear that my kids will put it through. 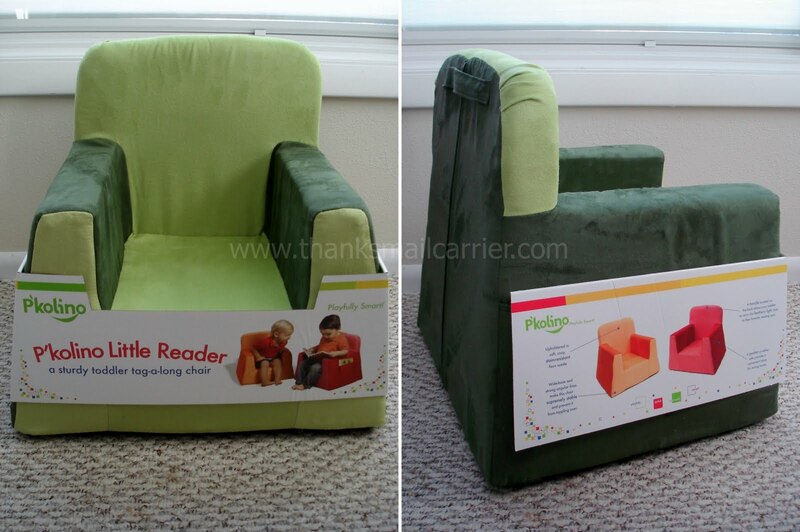 The shape of the Little Reader is different from the norm in that the wide base and angular lines give it an attractive look while also making it completely stable and solid enough that a child can sit down into it and not worry that it will tip over. Even better than that, this chair weighs in at six pounds, which is basically nothing. 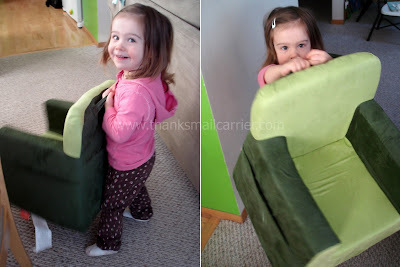 Any child can easily grab the handle right on the upper back and move it from room to room or pick it up and put it away when they're done by the bookshelf. Little Sister B had the Little Reader up and was walking around with it within minutes and was thrilled to be such a good helper! Designed for ages 2 and up, the P'kolino Little Reader measures in at 18" wide x 16" long x 18" high, which is just right for her. Big Sister E, on the other hand, is slightly tall for it... or at least that's what I originally thought. She firmly disagreed and says that it fits perfectly. 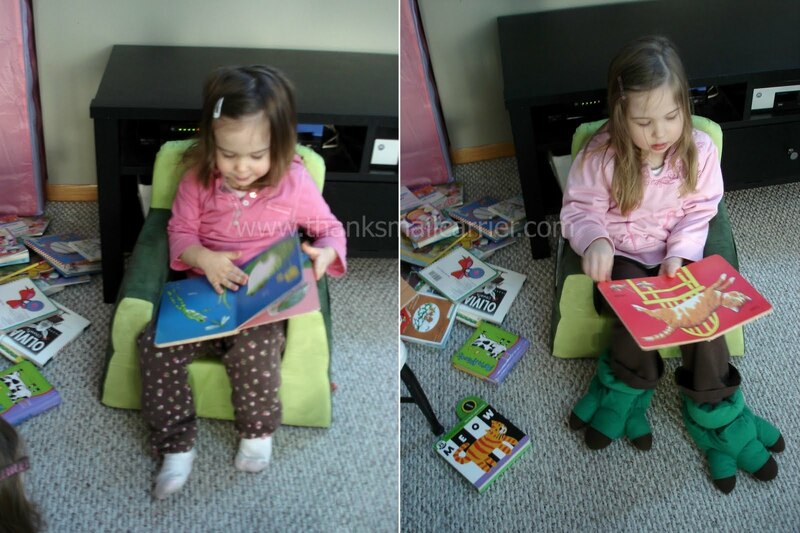 Either way, both girls adore this chair (a little too much in that I have to stand and referee over whose turn it is to sit and read in it) and it provides just the right place to hang out with their favorite books. I think the arm rests are a great touch and the inclusion of the pockets on the side are just right to tuck in the next book that is waiting in line to be read. 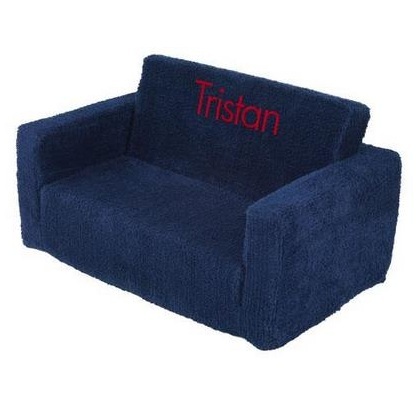 All in all, this high quality, tag-a-long chair is a wonderful addition to any reading corner, play room, bedroom or anywhere that your child might want to sit and take a load off. Available from Kids Chair World in five fun color combinations, the P'kolino Little Reader Soft Kids Chair retails for around $99 and will soon be the favorite resting place for any lucky little one in your life. Offering parents durable, functional, and high quality kids chairs and furniture at competitive prices, Kids Chair World has a huge selection of kid-friendly items that you are sure to love for your home or as an amazing gift. From individual kid-size sofas to table and chair sets that are great for inspiring artistic creativity, they have it all. 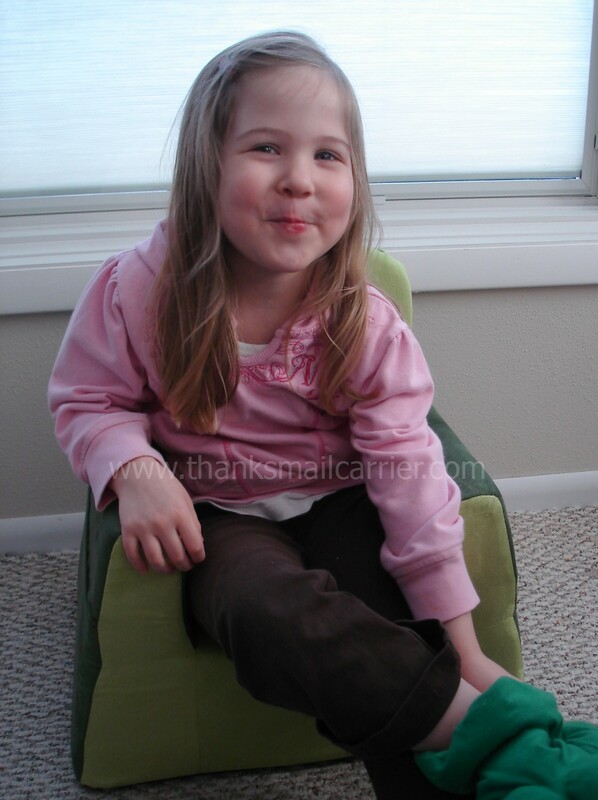 One lucky person will win a $100 gift certificate to Kids Chair World! To enter to win: Copy and tweet the exact tweet below and then leave me the link (to get the link, click on the time/date stamp of your tweet and then copy the URL). Tweet daily for an extra entry every day! Amazing chairs are at Kids Chair World http://bit.ly/gTPwu9! Enter the #giveaway to #win a $100 gift certificate: http://bit.ly/eMgwWz! 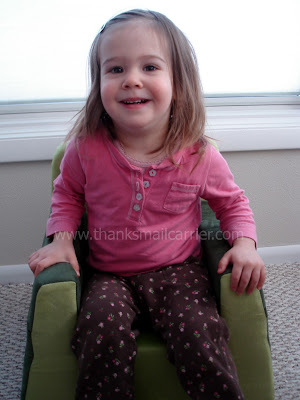 1 Extra Entry (per method) if you Like Kids Chair World on Facebook. 2 Extra Entries (per follow method) if you follow me publicly with Google Friend Connect, subscribe to my RSS feed, subscribe to Thanks, Mail Carrier by email, follow me on Twitter, become a fan on Facebook, or add Thanks, Mail Carrier to your blogroll. Giveaway will end on May 16th at 11:59pm CST. Do me the favor of leaving an email address or making absolutely sure it is visible in your profile, I have to have a way to contact the winner. The winner will be chosen by random.org and announced here as well as emailed and will have 48 hours to contact me or respond to notification or a new winner will be chosen. This giveaway is open worldwide! If you're reading this, you can enter! A big thank you to Kids Chair World for providing a P'kolino Little Reader for me to review as well as a $100 gift certificate for one lucky giveaway winner. The opinions shared are my own and honest and if you really need to see more, click here to see how I roll. I entered The Puzzle Pod Giveaway. I entered your Creative Toyshop Giveaway. I entered your JC Jewelry Design Hand Stamped Jewelry Giveaway. I entered your ProFlowers Giveaway. Tweeted!! Thanks for the opportunity! Like Kids Chair World on Facebook. I entered your Energizer National Parks giveaway.